Virginia adds automotive to its list of key industries. 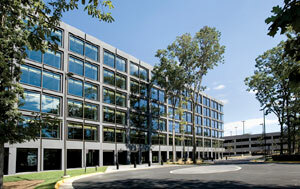 Woodland Pointe in Herndon, Va., will be the new home of Volkswagen of America's relocated headquarters. hen Jim Evans showed a group of site consultants around his company's gleaming, new, trophy-class, 185,000-sq.-ft. (17,187-sq.-m.) building, nestled inside a wooded and tranquil business park minutes away from Dulles International Airport in Fairfax County, Va., he had no idea who the client was. And the consultants weren't sharing. Nevertheless, Evans and his team from Tishman Speyer, which controls the Woodland Pointe building and surrounding business park, agreed to talk contract terms. It wasn't until after the two sides settled on terms that Tishman Speyer learned the identity of its new tenant: Volkswagen of America, which had conducted a cloak-and-dagger mission to explore the relocation of its corporate headquarters from Auburn Hills, Mich.
" 'Trust us. You'll like it.' That's what the brokers from Staubach told us," when they declined to reveal the client's identity, Evans says. While negotiating contract specifics with an unknown client was a bit out of the ordinary, Evans says, "we have a strong relationship with Staubach, so we were willing to move forward, unusual though it was." Volkswagen's new facility is a stone's throw from Dulles International Airport, where a major expansion is under way. The location sits in the heart of the nation's wealthiest county, where students receive great public school educations. Virginia governor Timothy Kaine sweetened the pot by offering $6 million in incentives. And yes, it only takes 20 minutes to drive from the company's new Woodland Pointe headquarters to Washington, D.C., for access to the country's decision makers on legislation affecting the automotive industry. But what is it about Virginia that would make a company pick up and move out of an area with 8.4 percent unemployment, an eager and idled work force and a deep tradition of automotive excellence to a region with almost zero unemployment and little presence on the international automotive industry cluster radar? The company's decision to decamp from Auburn Hills comes back to Midwestern Americans' love affair with cars – American cars. 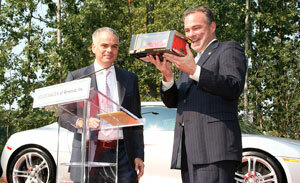 Stefan Jacoby, left, chief executive of Volkswagen of America, offers Virginia Gov. Tim Kaine a model of a red Volkswagen Beetle. Kaine helped put together a $6-million incentive package for the automotive firm's $100-million headquarters relocation to Woodland Pointe in Herndon, Va., from its former home in Auburn Hills, Mich. They don't seem to love Beetles or Audis. "We want to be closer to our customer base," acknowledged Volkswagen America CEO Stefan Jacoby in his announcement speech. The Northern Virginia area "has one of the highest concentrations of Audi and Volkswagen vehicles in the country," he added. For now, the Volkswagen move is about the customer base. But the company has tantalized state economic developers with the possibility of setting up a manufacturing plant in Virginia at some point in the future. Accessibility to Virginia's expanding Atlantic Ocean port in Hampton Roads may play a critical role in this decision as the company evaluates its supply options. "VW said they wanted a place that reflected the company – innovative, forward thinking, creative and international – and they found a match in Virginia," says Gov. Tim Kaine. Since January 2006, the state has seen an influx of 31,000 new jobs and $34 billion in new investment. The state's mid-Atlantic location is also a powerful lure. "We are within 750 miles (1,208 km.) of two-thirds of the country's population," notes Virginia Secretary of Commerce and Trade Pat Gottschalk. The state's pro-business attitude, including a comparatively low regulatory burden, is reflected in the elected leadership, according to Gottschalk. "We elect governors who think business is important," he notes. "Overall, the state gets an 'A' for business," comments site consultant Dennis Donovan, principal with Wadley-Donovan-Gutshaw Consulting. From fiddle-friendly Galax in southwestern Virginia to dog-friendly Alexandria in northern Virginia, the state offers a variety of personalities to suit the range of businesses in search of a new location. Manufacturers, creative industries and life sciences firms are drawn to the state's centrally-located capitol, Richmond. Defense contractors, logistics providers and back-office operations are flocking to the Tidewater region to the east. Furniture and food processing companies are drawn to the strong manufacturing traditions of Danville, bordering North Carolina to the south. Life sciences firms are expanding in the shadow of the Shenandoah River, in Rockingham County to the west. Headquarters operations and technology firms are flocking to Northern Virginia from all over the country. Virginia's greatest strength, Donovan says, is the breadth and depth of its right-to-work work force. "The state appeals to a wide variety of industries, because the range of communities and workers is so diverse," he says. For companies with a need to rub elbows with the nation's power brokers on Capitol Hill, in the White House and at federal agencies, Northern Virginia, which includes Fairfax, Arlington, Loudoun and Prince William Counties, as well as the Cities of Alexandria, Falls Church and Fairfax, offers major cost advantages over the District of Columbia. A quick lease rate comparison reveals the advantage: A tenant paying $35 per sq. ft. for Class C space in the District could pay the same amount for Class A space in nearby Arlington, easily accessible by the region's extensive and expanding subway system, Metro, and but a few miles from Reagan National Airport. Existing Class A buildings in the District are in the mid-$50-per-sq.-ft. range, while newly developed trophy assets with all the bells and whistles are pushing into the $70-oer-sq.-ft. range. In Prince William County, which cuts a swath across the southern edge of NoVa, rents average in the $23-per-sq.-ft. range, according to commercial real estate brokers Grubb & Ellis. With a technology work force of 33,000, thousands of technology firms have clustered in the area as well. Northern Virginia, boasting proximity to 40 colleges and universities, draws on an ever-replenishing pool of young and sophisticated workers to feed expanding businesses like McLean-based Apogen Technologies, which is adding 266 workers. According to Evans, companies are also drawn to the region because there's an existing pool of attractive and easily accessible office space. "Quality developments such as Woodland Park provide tenants with growth opportunities, high visibility, great retail amenities, high quality architecture, great sponsorship, and solid base of tenants," he says. The Tidewater region, including Newport News, Hampton, Chesapeake, Virginia Beach and Suffolk, has experienced an explosion in growth of defense-related companies, in large measure because of the major presence of US military. EchoStorm is growing by leaps and bounds in Suffolk, in part because that puts them near their main client: the U.S. Joint Forces Command. the U.S. Joint Forces Command, say company executives. "We are expanding, but we wanted to stay in Suffolk because this is where our main customer is," says company president and co-founder David Barton. Last March, the company moved from its 4,000-sq.-ft. (372-sq.-m.) facility to larger digs – 15,000 sq. ft. (1,394 sq. m.) in Suffolk's Bridgeway Technology Center – a move that will support the company's rapid growth, Barton says. In fact, the company is adding on already, building out to 44,000 sq. ft. (4,088 sq. m.) He notes that the headquarters of Joint Forces Command are just down the road. Neighbors at the relatively new but rapidly filling Bridgeway center include fellow contractors Lockheed Martin, SAIC, and Northrop Grumman, also an advantage. 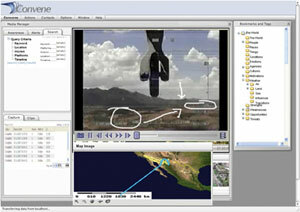 "The location also allows us to collaborate, " Barton notes. "We are partnering on a project with Lockheed right now." EchoStorm, which estimates $15-$20 million in revenues this year – four times the company's 2006 revenues – plans to remain headquartered in Suffolk, even as it opens additional offices in other locations, including Silicon Valley, Atlanta, Northern Virginia and the United Kingdom. The massive gun-metal grey ships docked just offshore serve as a powerful reminder of this area's strong naval presence. The region also boasts advantages for the private sector-including access to the deep-water port of Hampton Roads, where logistics capabilities have expanded with the opening of the new Maersk Terminal. Companies finding convenient homes for their distribution centers because of these logistics strengths are deciding that there's more to Tidewater than supply chain efficiencies, though. Home goods purveyor Lillian Vernon is consolidating its operations here, after locating its national distribution center in the area several years ago. The company recently announced plans to move out of New York entirely, co-locating its corporate headquarters with the distribution center in an 827,000-sq.-ft. (76,828-sq.-m.) facility on International Parkway. In August, AvalonBay Communities, an Alexandria-based real-estate investment trust company announced plans to open a $1.25 million, 22,000-sq.-ft. (2,044-sq.-m.) customer care center in Virginia Beach, following an exhaustive search. Site consultant Dennis Donovan, whose firm advised the company, says that the company was drawn to the Tidewater region because its work force had the skills the company needed. "We were looking for a location that had a base of financial services and a workforce with strong accounting and customer service skills," he says. "We also looked at the education network, because we wanted access to both two-year and four-year colleges." Costs are favorable as well. "The company can offer above-market salaries in Virginia Beach that are lower than market-rate salaries in other places," Donovan says. The A.P. Moller - Maersk terminal in Virginia features six post-panamax gantry cranes, 30 rail-mounted gantry cranes, and 20 shuttle trucks, allowing up to four large container vessels to be worked simultaneously. Twenty-four gates allow easy truck access to Route 164.
raffic is a problem in parts of Virginia. A big problem. At a recent presentation for prospective William and Mary students in Williamsburg, the young admissions officer characterized the college's location as "somewhere between a two-hour and a twelve-hour drive to Washington, D.C." He was only half-joking. During the 2007 legislative session, Gov. Tim Kaine – a Democrat – and state legislators from both sides of the aisle took decisive action to remedy this increasingly troublesome situation. They pushed through landmark legislation that immediately opened an annual $1-billion funding spigot for much needed road, rail and mass transit improvements. The legislation also empowers regional decision-making and authorizes localities in the most congested areas to impose impact fees to fund local transportation projects. "Our transportation infrastructure was a weakness," notes Gov. Kaine. "But our bipartisan effort in the legislature this year gave the state a sizable chunk of reliable new revenue for transportation." The legislation increases road spending by 30 percent, mass transit spending by 40 percent, and rail spending by 65 percent, he says. The state also has seen a $450-million investment in the port of Hampton Roads, the third largest on the East Coast, with the opening of Maersk's new, high-efficiency, deep-water container terminal, capable of handling 1 million TEUs annually and with the potential for additional expansion. And Dulles International Airport is expanding to meet growing demand, adding runways and installing a new control tower to meet growing demand, with hundreds of domestic flights plus 400 non-stop flights weekly to foreign cities, including a new direct route to Beijing. The Geico caveman, the brown-clad UPS delivery guy, a buff Michael Jordan in Hanes briefs: iconic images all. And all ideas manufactured by the quirky brain trust known as the Martin Agency, a Richmond-based advertising firm that's part of a growing advertising industry cluster in the Virginia state capitol. The local industry's close ties to Virginia Commonwealth University, which offers specialty undergraduate and graduate degrees in advertising and related fields, ensures a steady pool of fresh talent, innovation and creativity to support growth. Manufacturers of products are also finding lots to like about this city's mix of southern gentility and urban sophistication. In September, DuPont announced plans to invest $500 million in a multi-phase Kevlar® production expansion, starting with a $50-million addition to its polymer line at the Spruance plant in Chesterfield County. While DuPont produces the polymer at other factories as well, company officials say that Spruance was the logical choice to begin their ambitious expansion. The decision represents a long-term commitment to the Richmond facility. "DuPont's Spruance Site in Richmond, Va., was selected for the polymer expansion because it was the best investment choice," says Spruance plant manager John Strait. "It is already the global supplier of Kevlar® polymer. The additional investment will help better position the site to meet the increasing customer demand and help solidify the future of the site." Southside, which encompasses cities such as Danville and Martinsville on the state's border with North Carolina, remains a pocket of relatively high unemployment following global shifts in textile and furniture manufacturing and the downsizing of the tobacco industry. The availability of workers, combined with incentives made available from the state and the Virginia Tobacco Indemnification and Community Revitalization Commission, makes the region an intriguing destination, particularly for firms in search of new manufacturing capacity. A recent beneficiary: Swedish furniture giant IKEA, which is opening its first US factory, a $281-million, 810,000-sq.-ft. (75,249-sq.-m.) facility in Cane Creek Centre industrial park. The company received $4 million in state grant funding and $2.4 million from the Virginia Tobacco Commission. Nestlé also announced a Danville factory expansion this year, investing $20 million to increase production of refrigerated pastas and sauces and refrigerated cookie dough products. The area's linkages with Virginia Tech's cutting edge research facilities, and its proximity to North Carolina's Research Triangle also make it a lower-cost option for firms such as Luna nanoWorks in search of a beachhead for technology-driven manufacturing. The company, a division of Roanoke-based Luna Innovations, invested $6.4 million to retool an abandoned tobacco warehouse in Danville, opening its cutting-edge nanomaterial manufacturing facility in 2004. Another advantage: Tobacco Commission funding has financed extensive investment in broadband communication in this part of the state. "This presents a very attractive mix for businesses of a low cost structure, available workforces and robust broadband," notes Secretary Gottschalk. Heading 120 miles southwest out of Northern Virginia, between the Blue Ridge Mountains and the Alleghenies off of Interstate 81 is Rockingham County, home to several expanding businesses. Coors' Elkton Brewery is adding capacity, PepsiCo invested $140 million for a new Gatorade factory, and Merck recently announced back-to-back expansions of its Stonewall plant, one of the company's seven domestic manufacturing facilities. In December 2006, Merck said it would invest $57 million to add on to its sprawling facilities, on 1,350 acres (546 hectares) south of Elkton. In June 2007, company officials announced a second $193 million investment to add three new buildings to the campus. Another life sciences firm, SRI International, is building a major drug research facility and campus in the county as well. For companies shopping for the best incentives, Virginia might not make the grade, say site consultants. Virginia incentives are "OK, not great," according to Donovan. Secretary Gottschalk states Virginia's position another way. "We tend to be a little conservative and more targeted in our use of incentives," he says. Businesses should also look carefully at the state's tax structure. "The state has a business licensing tax that is just a nuisance, and the machinery tax can be on the high side, which is a disadvantage for capital-intensive industries like manufacturing," Donovan notes. And in some areas, such as the I-81 spine that runs north to West Virginia and Pennsylvania and south into Tennessee through the western part of the state, companies may struggle to recruit workers. "There are spot labor shortages around the state, and this will intensify unless the state re-invests in basic skills training," Donovan notes. "In some areas, the level of work force skills are not where they need to be," acknowledges Gov. Kaine. One new pilot program, funded with a $500,000 grant from the National Governors Association, establishes six magnet centers around the state that will combine career and technical training, standard high school course work and work-release programs in partnership with local businesses. Graduates will earn high school diplomas, industry certificates and college credit in these new Governor's Academies for Career and Technical Education. State officials are planning an overhaul of the state's work-force development programs as well. "We are trying to streamline workforce development, which right now is spread across multiple agencies," explains Gov. Kaine. The realignment will improve the efficiency and effectiveness of programs, ensuring that they are linked closely to the real-world training businesses are demanding. "We want to put the center of gravity into our community college system," the governor says. Virginia's community college system, with a regional presence throughout the state, maintains close ties to the business community, allowing a flexibility and responsiveness as workforce needs change. Leading from a center of strength makes sense, according to consultants.